As a child, I could lay in bed and watch through my bedroom window as a train approached from the east. Initially, I would just see a small light moving in the distance. Drawing closer, the light would get larger and more intense and as he rounded the curve two blocks away, the room was filled with light and then sound as he blew for the three crossings in town. Sometimes it would be the yard engine from Richmond instead of a through train. I could tell because the headlight approached slowly until it stopped at the siding turnout off the main just east of First Street. Snug in bed on a cold night, I could watch the headlight move back and forth, as the crew executed a flying switch to drop the cars onto the siding because of the facing point turnout. Soon the night stillness was interrupted by a cut of cars rolling past the house at a good clip with flanges squealing all the way and accompanied by the sound of rrrattch, rrrattch, rrrattch as experienced hands worked a brake wheel like a musician playing his instrument. 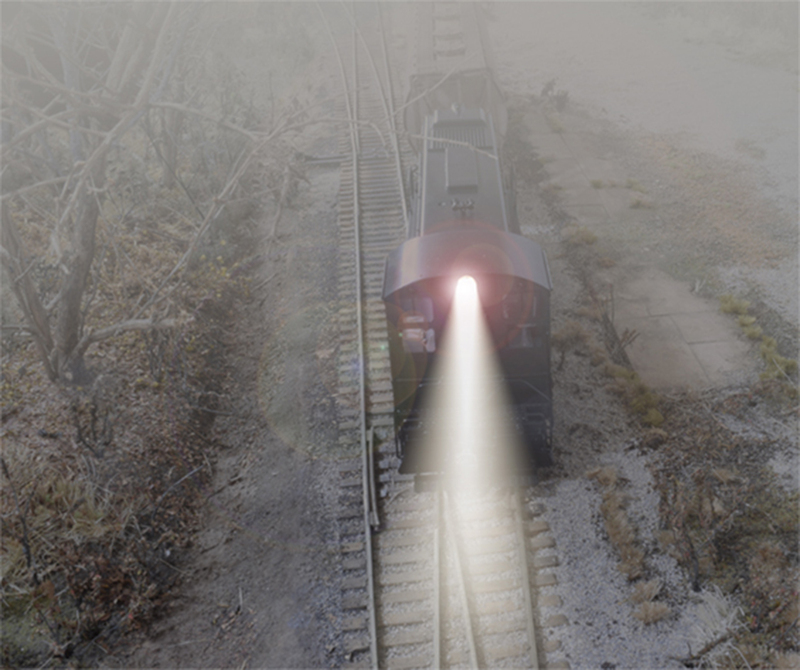 As the cars coasted on their three block long solo, the locomotive methodically followed them down the siding, the glow of the headlight filling my room. The leafless tree outside my window created shadows that danced across the wall and my bed, as the blinding glare of that Cyclops eye came closer and closer until, mere feet away, he lumbered past the house to the sounds of creaking rail, groaning ties and the constant throbbing of the engine. We all have a story, one as unique as the person telling it. For many of us, such memories fuel our fascination with trains long after the event itself occurred. Yet, as powerful as they are, we’re often afraid to share them publicly for fear of looking foolish, sentimental or sappy. It’s best to keep that “soft stuff” under wraps we think. 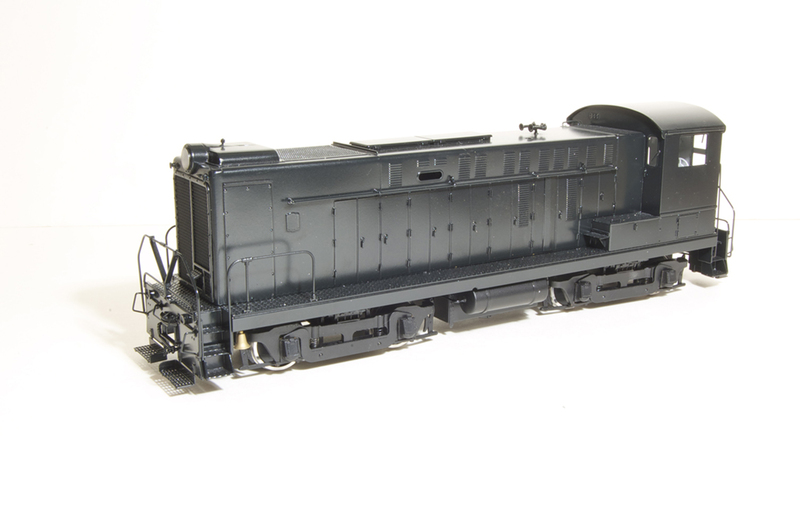 It’s a quarter-inch scale Baldwin S12 from RY Models, though some might mistake it for an Athearn HO unit. The point however, is that we render things lifeless by reducing them to the literal facts, because that’s the conversation we’re trained to use: it’s just a Walthers’ building, Micro Engineering track; an Atlas boxcar. I don’t see a product. I see a New York Central branch job of the 1960s, working his way up the Whitewater Secondary, treading carefully over rails laid before World War I; the crew wondering how far they’ll make it before something lands on the ground. Railroading, and yes, modeling too, are filled with human stories that we ignore or label with shallow terms like I’m modeling the 1950s steam-to-diesel transition. We fire off that phrase and others like it as if they embody some universal truth we’re supposed to instantly comprehend. However, as a good friend pointed out, my 1950s experience (that I’m too young to even remember) may be very different from yours. And, I would further add that railroading on January 1, 1950 looked far different than railroading on January 1, 1959. So, just what is that generic description supposed to mean anyway? Instead of just saying: “I’m modeling the Fifties.” why not entice us with a story we can invest ourselves in? “I’m modeling November of 1957, when a PRR J1 worked the last steam powered freight out of Richmond, Indiana bringing an end to the city’s 103 year old era of steam locomotion. An era that ended with far less fanfare and pomp than when it began.” This is a more compelling story that provides the specifics of time and place along with a character and situation we want to know more about. We assume that everyone knows what we’re referring to with all our jargon, and while that might be true among peers, such understanding is usually non-existent outside our tight little circles. Aunt Bessie or neighbor Fred don’t know squat about trains but they might relate to a story of how the noise from a passing train made conversation impossible in my grandmother’s living room because the house was less than forty feet from the tracks. Or they might sympathize with the frustration and panic my grandfather experienced in the 1920s, when a Railway Post Office clerk failed to throw a mail sack hard enough to clear the train. As a result, it was sucked under the wheels and shredded, sending loose mail everywhere. My grandfather was responsible for taking the mail from the depot to the town post office and had to gather every last piece he could find. He did but what a mess it turned out to be. What happened to the sense of wonder we once felt about trains? We tell ourselves that stuff is for the little ones and their overactive imaginations. We’re all grown up now and it’s time to get serious about building that empire. So the conversation turns to the “guy stuff” we all know how to comfortably communicate: benchwork, product choices, best practices and how-to do everything. And so, we have what we want, a sterile commoditized list of things to do and goals to shoot for. Yeah, we can handle that no problem. What happens though, when the list is all we have? We get a generalized, lifeless rendition just like the hundreds of others we’ve all seen before. As mentioned earlier, we all have a core story that fuels our involvement with modeling trains and railroading. For many of us, that emotional core has been buried under mounds of model railroad jargon and track planning mentality. I believe that core is worth finding again. Going back to my childhood, in the cold darkness, the noise and glare of a passing train could have been frightening. Safe, warm and snug under the covers, it was magic that makes my heart sing to this day. What is it about trains that makes your heart sing? How will you express that? Great story Mike. I heartily agree. Writing the story of my railroad, rather than being a chore as many history writing assignments were in school, has been a about as much fun as the modeling itself. It has helped bring my other hobby, history, into the model railroading fold. Having written a history of the free-lanced railroad I model has given me a broader perspective than the mere time period and location being modeled alone would have. It has forced be to learn the history of railroads similar to what I want to model and the area I wish to model. By doing this I can hone into the small change that might have swung history to what could have been. It also helps me to avoid the pit fall that haunts many free-lancers of randomly cherry picking the favorite parts of many railroads and severely stretching plausibility by cramming them together in an unlikely combination of place and time. Of course like all good history, it soon becomes a story of people more than machines, and I think this viewpoint makes for a more realistic model whether one models a specific prototype, or free-lances. Thanks for being my Wednesday wake up Mike. Also, thanks for bringing back the cherished memory of M&StL…oops, sorry, CNW ore trains rattling across the double diamonds on the CB&Q mainline a 1/2 block away from my bedroom. I wish I could drift off to sleep with that rhythm echoing in my dreams just one more time. Thanks. In model railroading, I’m left with a feeling that we add a story to a model railroad long after its construction has been completed, almost like the model railroad equivalent of small talk at a party or a joke to open a speech with. The story is what we’re creating. We only need the models to embellish it and provide the right trigger at the right moment to guide our imagination. It reminds us of why and will carry us through times when things aren’t working out in a way that minimum curve radii, track centres, or turnout sizes can never. We do have evidence of the power and potential of story by incorporating more aspects of prototype operation into our operating sessions. I mean, really, there are no practical reasons to use train orders to run a model train – the models work pretty much the same way with that paperwork as they do without. Yet, having that paperwork helps us tell the story of that train, on that day. Imagine the layouts we could create if we thought about the whole thing in as much detail? Thank you for sharing this. For inviting us to see your work the way you do. Scale, era, locale are all metrics that help us understand our work but force us to test our definition of those things against yours. Every time mine doesn’t match yours, we grow apart and by insisting on providing these, It doesn’t matter if I think in N and you in O, we both remember a time like the one you describe. That’s powerful stuff. I think that’s something we could be striving for. Thanks for the great points. I appreciate that you both took the time to offer such depth in your comments and built upon the post. We’ve focused on the design process for so long that I believe we’ve confused it with the end result it’s supposed to give us. A trackplan doesn’t define a satisfying layout, in the end it’s just one component among many that all contribute to the satisfying experience we want. We can recite the trackplanning mantras in our sleep but go blank if we have to go beyond them. This subject is ripe for picking and coverage is long overdue.